.Of course we couldn’t be in Seattle without going to Pike’s Fish Market. Then we had dinner and caught up on each other’s doings. Bob updated me on his life for the past few years. "I am now semi-retired and a Tour Manager/Director for a variety of companies. Last year I did three 16 day National Parks Tours (Yellowstone, Grand Tetons, Arches, Monument Valley, Grand Canyon, Lake Powell, Bryce Canyon and Zion). I also did two 14-day Columbia and Snake River Cruises with a Lewis and Clark theme. This year so far I have done a 14 day National Parks tour which included all of the above plus Badlands, Mt. Rushmore, Custer Memorial, and Mesa Verde. I just finished a 4 day Train trip to San Francisco and Cruise to Vancouver, B.C. aboard Princess. Looking forward to the summer and fall." So as you can see, Bob has been getting lots of walking. He almost wore me out until I put a leash on him. The next day we boarded the cruise ship and headed for open waters. After clearing out of the Inside Passage we hit some rough water, causing Caroline to skip dinner and Kathy later on to wind up in Sick Bay. All was well later the next day and we landed at Juneau. Took the tram to Mt Harris and saw a wonderful vista. On our way to Skagway, a passenger became seriously ill and caused the ship to divert to Sitka to drop him off for better treatment. That delay caused us to arrive several hours late at Skagway, resulting in the cancellation of many land excursions. We then headed out to the Hubbard Glacier, a beautiful sight. It was about a mile wide at the location where it entered the sea. Its height was about 300 feet and occasionally we could see the face calving (falling) into the sea. The captain said that we got the closest distance to the glacier that the ship had done so far this season. We were about a mile and a half away. From there we pressed on to Ketchikan, staying in the Inside Passage and avoiding the rougher seas. Ketchikan looked more like what I was expecting Alaska to look like. All three land stops had plenty of the same shops for tourists to visit. The scenery along the way was spectacular. There were hundreds of mountains and dozens of glaciers to gawk at. We saw one whale’s tail break the water’s surface about a mile away, a couple of mountain sheep, some bald eagles, some seals or sea lions, not sure which, no bears, lots of seaplanes. (Many towns and cities in Alaska have no highway access.) Plan to do it again sometime. 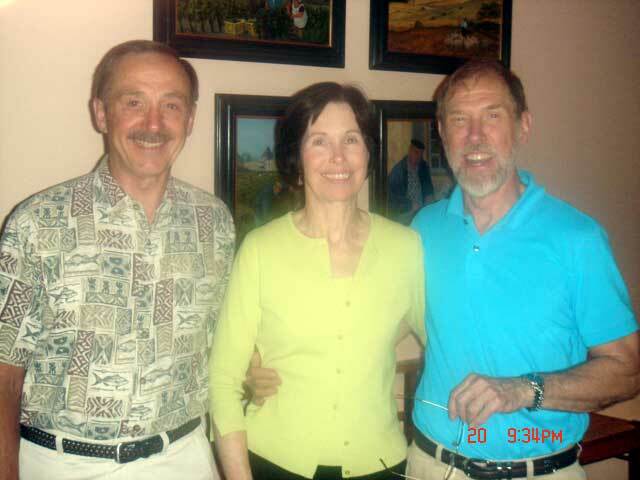 Got an email and picture from Bob Connolly, to wit, "Pat and I were in town for our son, Mike’s, graduation from NWC. Our son is USAFA class of '85. We were quite proud of his graduating as a Distinguished Graduate. 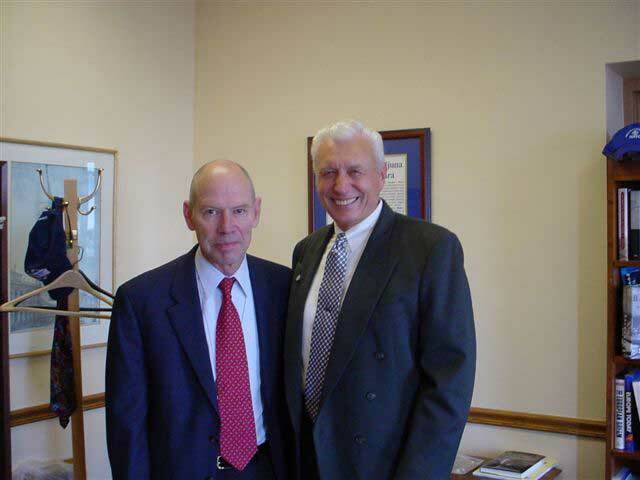 Attached is photo of Roy Stafford and I in his office at the National War College. Roy is currently the Dean. Although he would like to retire, the Commandant regards him as a national asset too valuable to let go. Bob Connolly"
Got this next item from John Flanagan who sent it on the Redtag net. "Redtags, First of all, thanks for all the supportive phone calls, cards, and notes. And visit from Bill Haugen and his wife. Contrary to Shep's speculation, Drs did find a heart, managed to open it up, and install a new aortic valve. Randy's call was particularly appreciated "been there, done that." However he had 6 months to deliberate choice between artificial valve or porcine tissue. Meanwhile, wife was flying from Paris where she works as international attorney. From my phone call she asks what all the background noise was. I replied, "Just nurses laughing." She was on next plane. You recall we were married at 30th reunion in Cadet Chapel after memorial service. By Thursday afternoon Drs. announced you are "#1 for surgery tomorrow morning." Only time I remember being #1 for anything was takeoff from Pleiku in a Bird Dog at height of thunderstorm and airport was "closed." Took off anyway. Just hoped surgery would go as well. Resident surgeon asked what style heart valve I wanted. Drugs now making me fuzzy. Dr. said artificial goes "click-click", you have to take medication forever, but lifetime guarantee (can you imagine sitting with your wife, some comely damsel walks by and heart increases to click-click-click). Inquired about porcine option. Said silent, 15 year warranty (quick math 66+15=81 years old). OK give me the pig. Problems: I find garbage dumps very attractive, I range through the forest looking for truffles (previously golf balls), and enjoy rolling in the mud. Drs. think they can alter my behavior pattern. Got even with John Kelly (USAFA '65) who provided info to Jerry Smith for original posting of my emergency. Recall he was trying to use up my Country Club minimum while I was in the hospital as well as rejoicing that pig valve made me more Irish. He made mistake of inviting MariJo and me to dinner at his club with him and Sally on a Friday night. (My first night out since surgery.) I entered crowded bar, with the Kelly's in attendance, dragging my IV pole with me with solution bag and tubing attached thereto. Kelly asked me if I'd care for a drink. Turned IV pole around, pointed to empty bag, and asked bartender to "Fill it up." I had affixed a rather prominent Gordon's Gin label to the bag. The entire bar cracked up. Flanagan 1, Kelly, zero. It was a great time. Jerry and Freddie were scheduled to join us, but terrorist crisis canceled their flight from Dallas. That's it for now. You're a great bunch of guys (with equally great wives) and unfortunately it takes a crisis to appreciate the depth of friendship, support, and camaraderie. Thanks to you all, I have now gained that appreciation. Flan"
Last April, I had a great dinner at the Mettlers’ home with Dave Holt and Kathryn & Steve Mettler. .
Well, that’s it for now. Keep the letters and emails coming.